Do you like trunk shows as much as I do. 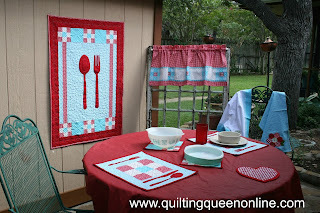 I love looking at the work of others and how they use the fabrics and colors, and especially how they do the quilting. I love Soma's idea at Whims and Fancies. 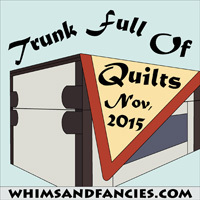 She created a Virtual Trunk Full of Quilts Trunk Show. What a fabulous idea. And I almost missed it. Thank goodness Jo at Jo's Country Junction posted about it. This one is American Pride. 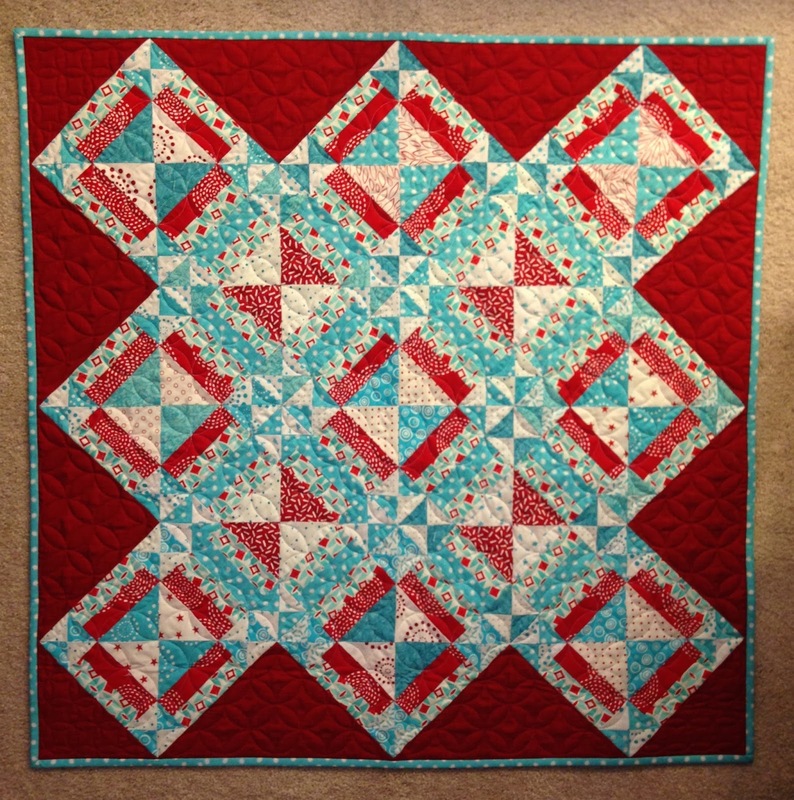 I made it using the block I designed for Quiltmaker's 100 Blocks Magazine Volume 10. Of course you know it's one of my favorites. It's my favorite colors red/white/blue. 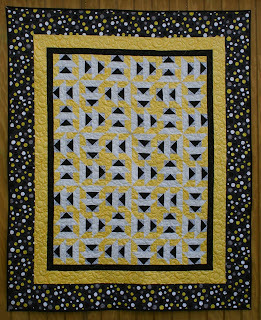 Hearts Desire is another quilt I made using the block I designed for Quiltmaker's 100 Blocks Volume 8. It was my first publication. Winter Wonderland was a long time in the making. It took what seemed like forever to finish all the hand embroidery of the blocks in the center. But it was worth it in the end. This is a small wall hanging I made for my momma. Her decor is red and black. I stole a vintage doily from her buffet and made this for her. I loved how it turned out and she loved it too! 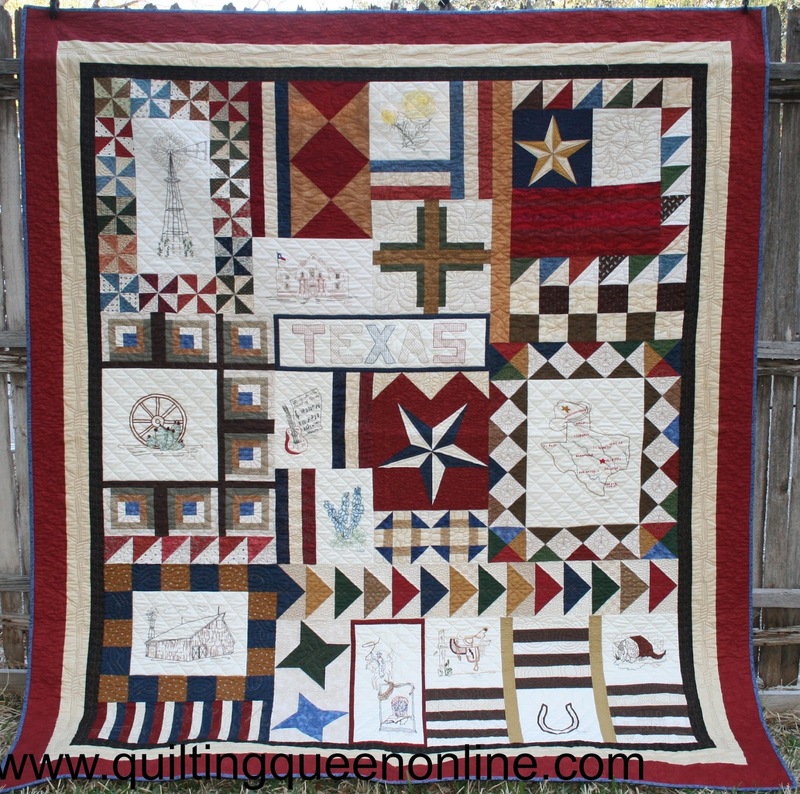 Another quilt that I hand embroidered it this Texas quilt. 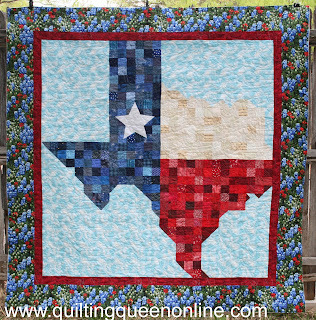 It was a block of the month from Stitchin Heaven called "Luvin Texas". Again, it took forever to complete the embroidered blocks. It hangs in my Texas Room and reminds me of my chapter in our lives in Brownwood TX. 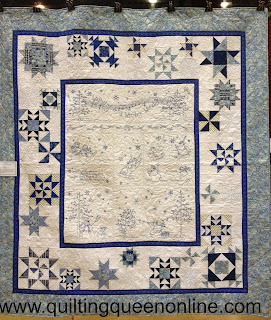 At the time I made this quilt, I lived in Texas and we rarely got any snow and when we did, it was gone the next day. It's called "Let It Snow". Now I would never say that where we live now. It's forecasted to snow on Saturday and I'm not ready for it. 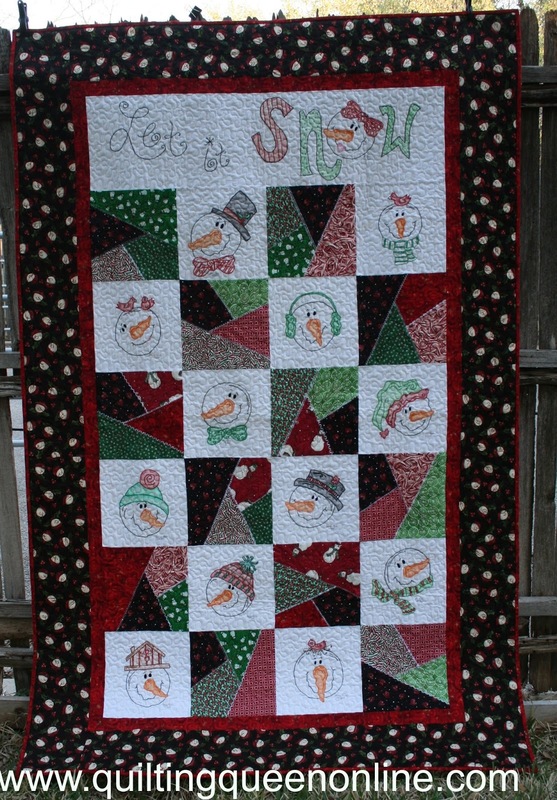 I love snowman quilts but I don't really want to experience the snow. Another Texas Favorite; "God Bless Texas". 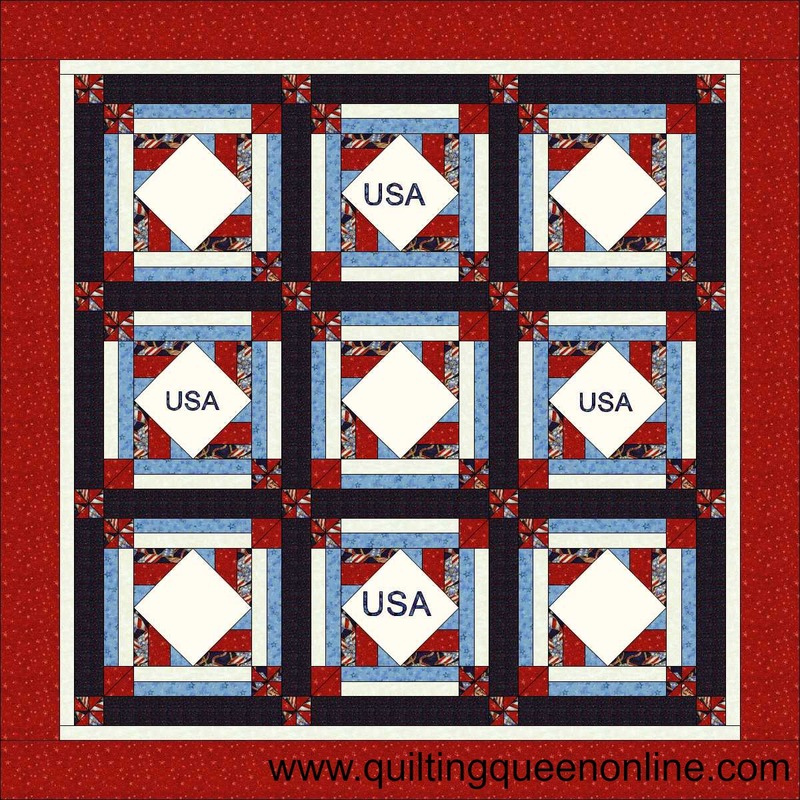 It's the first quilt pattern I published. I designed this quilt for The King. Funny I gave away 8 of these and he still doesn't have this exact one. But I made him one that has sampler blocks around it instead. You can get the pattern on my "patterns" tab or from Etsy, Quilt Peddler, or Craftsy. 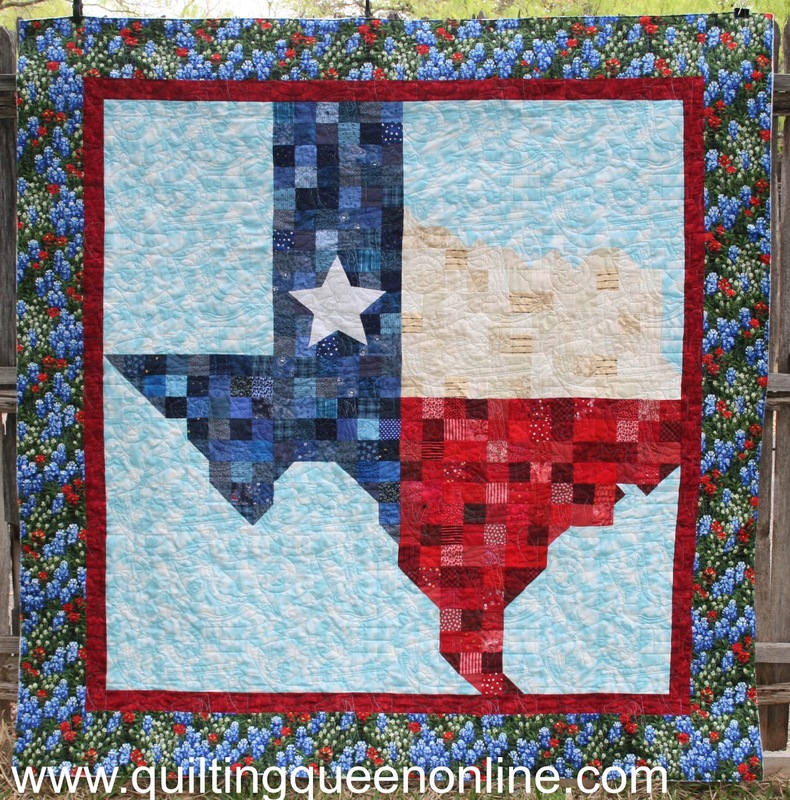 Next to God Bless Texas, this one called "Traffic Jam" is another one I designed and is my 2nd best selling quilt pattern. It looks fabulous made up in bright bold modern fabrics or sports team fabrics, the possibilities are endless. This one is throw size but I'm working on a Full/Queen and a King size version as well. I rarely make things "quilty" other than bed quilts. I don't know why because I always like anything I've made. These accessories for my Retro Kitchen are no exception. I loved how they turned out. And to go along with all the Retro Happy Kitchen things, I made this Retro Happy Quilt table topper as one of the projects for the Addicted to Scraps Team for Quiltmaker Magazine using Bonnie Hunter's block Gifty Boxes. 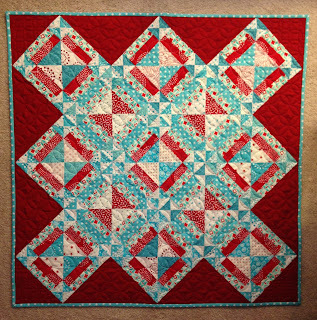 Another Addicted to Scraps project using Bonnie's Block Idaho Square Dance and of course red/white/blue again. 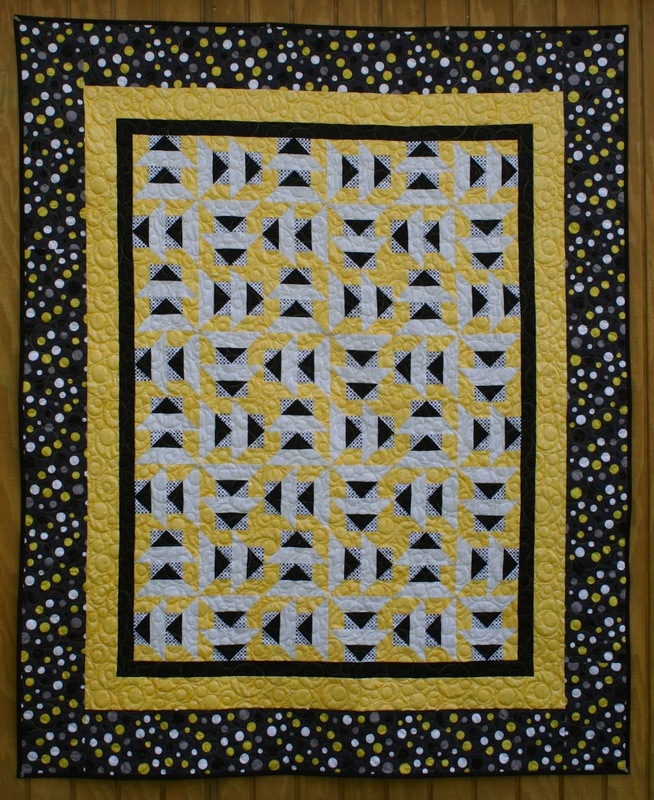 Last and certainly not least is "Modern Dutchman" made from my block in Quiltmaker's 100 Blocks Volume 9 issue. It's also a pattern for sale on my "patterns" tab. I especially like the modern feel to this one. Modern is completely out of my box! I hope you enjoyed my little Trunk Full of Quilts. It's only the tip of the iceburg and it's impossible to pick my favorites. I like them all! 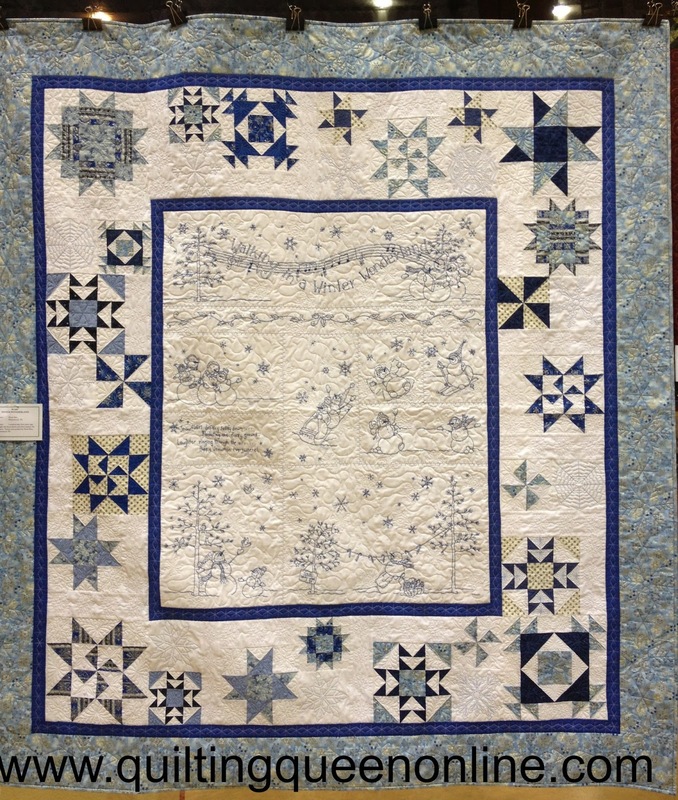 There are also some pretty awesome quilts featured in the Trunk Full of Quilts Trunk Show. You need to go check them out here. Plus there are prizes! Whoo Hoo!!! That snowmen one is adorable!! And I love the Texas one. I've wanted to try doing something like that for my home state of Idaho. So fun!! Yes indeedy, there is nothing quite like peeking in others' trunks and gazing upon their beautiful quilts. My goodness, you have stitched some beauties! 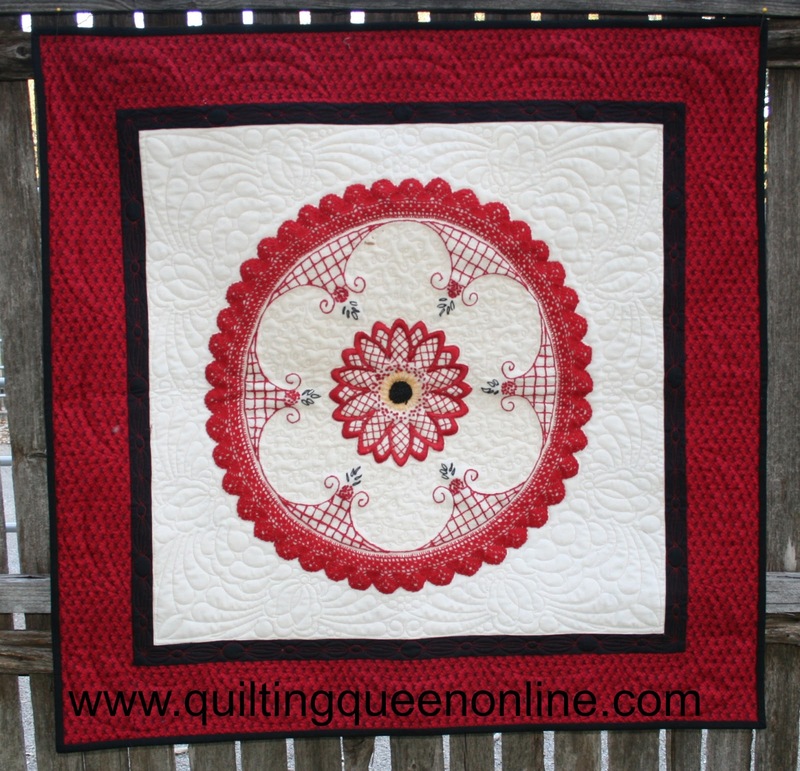 Winter Wonderland is gorgeous; so much instricate stitching....but then all you quilts ooze gorgeousness! 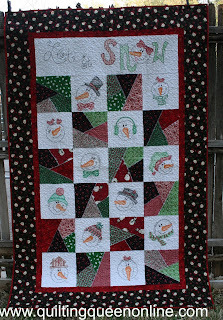 I love that snowman quilt! Some of them are "old" favorites to me and some are new and fun to see. 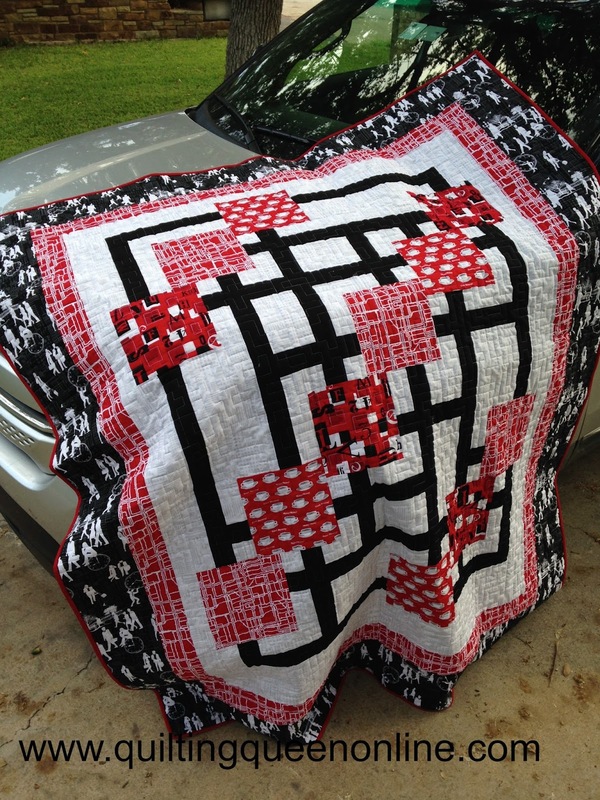 I love your traffic jam quilt. It's fun to see all of them. Great trunk show! Love the snowmen but I think Winter Wonderland is my fav. thanks so much for posting these. 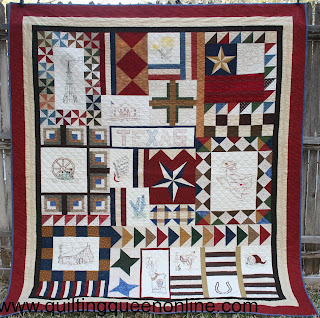 A wonderful collection of quilts. Thanks so much for sharing. What a great trunk show! You've made so many beautiful projects. Winter Wonderland is amazing!